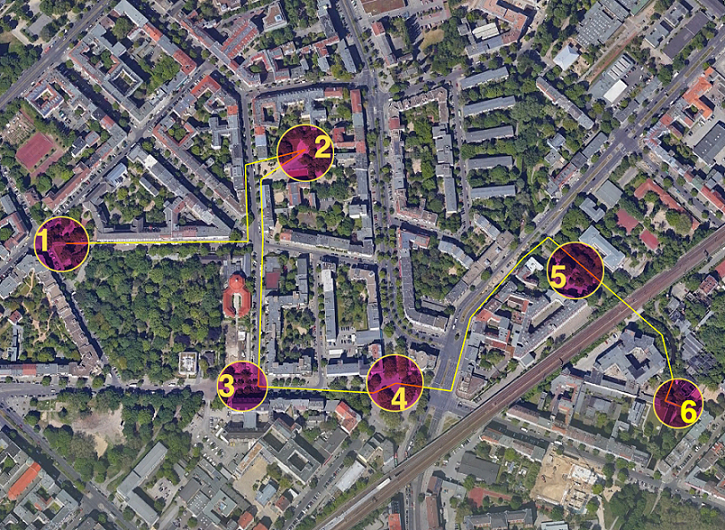 On September 11 2018, we led a soundwalk in Mitte Pankstraße area, organized within the framework of the public participation campaign held in preparation of the next Berlin Noise Action Plan “Berlin wird leiser”, with the aim of involving stakeholders and inhabitants living in the area in the evaluation of quiet areas nearby the Pankstraße area. The soundwalk was led by Dr. Antonella Radicchi (TU Berlin) and organized by the Berlin Senate, Senate Department for the Environment, Transport and Climate Protection, in collaboration with the district Mitte of Berlin and the Quartiersmanagment Pankstraße. Today’s newsletter will report on the initial results of the quiet area evaluation performed by the participants during the soundwalk. By sharing this story, we hope to grasp your curiosity on soundwalks: powerful participatory excursions, whose main purpose is to listen to the environment, evaluate its sonic impact on our health and develop strategies to improve it. Soundwalks are indeed effective research methods adopted by the international scientific community and regulated by international standard norms, e.g. ISO 12913-1:2014 and ISO/DIS 12913-2. If you are curious to read more about the method of soundwalking, find here “A Pocket Guide to Soundwalking” written by Dr. Antonella Radicchi. By sharing this story, we also hope to raise your awareness on the importance of identifying and protecting urban quiet areas, an open issue at the European policy level. The European Environmental Noise Directive (EC 49/2002) indeed requires Member States and their major cities to develop plans to protect quiet areas, as measures to reduce noise pollution in cities and safeguard citizens’ health and well-being. The soundwalk was joined by a group of 14 committed Berliners, including people living in the area, and officials from the district Mitte of Berlin, the Quartiersmanagement Pankstraße and the Berlin Senate, Senate Department for the Environment, Transport and Climate Protection. The meeting point was at the corner of Ruheplatzstrasse and Antonstrasse, where Antonella gave a short introduction to the activity. Printed questionnaires were also distributed to the participants who could not use the Hush City app. Then, the participants were engaged in “ear cleaning” exercises, which were invented by Murray Schafer – the father of the soundscape studies – with the aim of helping the soundwalks’ participants in re-tuning into the environment and open the ears. Antonella led the soundwalk along a predefined route, composed of 6 listening points, identified in agreement with the district Mitte, the Quartiersmanagment Pankstraße and the Berlin Senate, Senate Department for the Environment, Transport and Climate Protection (see the map below). The participants were invited to walk along an ideal line at slow pace in silence, following Antonella who guided the group while recording the sonic environment with her H4 ZOOM recorder. Walking in silence and stay focused on listening was clearly a challenge for the majority of the participants, who tended to walk in small groups and talk along the route. At each listening point we stopped, and the participants were asked to listen to the environment in silence for a couple of minutes. Then, they were invited to evaluate the quiet area where we were, by replying to the questionnaires or by using the Hush City app. At the end of the soundwalk, we had a discussion about the overall experience. Whereas the traditional acoustic planning approach relies on measurements and calculations to map and evaluate environmental noise, the soundscape approach aims at studying the sonic environment, focusing on the way “people perceive, understand and /or experience [it] in context” (ISO 2014). To bridge the two approaches, we cross-analyzed the noise levels measured at each listening point with the level of perceived quietness expressed by the participants thought a 5-point linear scale (not quiet-very quiet). The results are illustrated in the diagram below. Diagram showing the cross-evaluation of noise levels measured at the 6 listening points with the level of perceived quietness expressed by the participants at the same points. Image source: © C.W., Hush City Mobile Lab 2018, TU Berlin. Overall data evaluation shows a consistency between the noise levels measured and the level of quietness perceived by the participants, confirming the assumption that citizens can be considered as smart, active sensors in the context of soundscape evaluation processes (Radicchi et al. 2017). Ambivalent results were found at the fifth area, a linear green path along the Panke river, which was perceived at the same time “not quiet”, “slightly quiet” and “quiet” by the participants. Although through the questionnaire many topics were evaluated by the participants, in this context we will discuss only the results pertaining: the noise levels; the level of quietness, the positive and negative sounds and the overall landscape quality, all as perceived by the participants. The first area at Plantagenstraße 17 was perceived as “quiet” by the majority of the participants, a result consistent with the noise levels of 41.3 dB(A). Among the positive sounds for the sense of quietness, participants mostly indicated: natural sounds such as sounds of the wind through the leaves, human voices, and church bells. A participant indicated the “absence of loud sounds”. Among the negative sounds for the sense of quietness, participants mostly indicated traffic noise. The majority of the participants rated the overall landscape quality as “good”. Do you want to explore the datasets collected in this area by the participants with the Hush City app? Click here! The second area, the playground at Adolfstr. 12, was perceived as “slightly quiet” and “not quiet” by the majority of the participants, a result relatively consistent with the noise levels of 50.5 dB(A). Among the positive sounds for the sense of quietness, participants mostly indicated: sound of wind through the leaves, kids playing and also people’s conversations, as well as “quiet atmosphere despite of loud sounds”. Among the negative sounds for the sense of quietness, participants mostly indicated (kids) yelling, although some participants softened their answers, e.g. by adding comments like “too much yelling by kids after a long work day” or “loud yelling of the kids can be stressing in the long run”. The third area, a small pedestrian area at Gerichtstraße 50/51, was perceived as “quiet” by the majority of the participants, a result consistent with the noise levels measured at 46.3 dB(A). Among the positive sounds for the sense of quietness, participants mostly indicated: sound of wind through the leaves, bicycles. And also: birds, absence of loud sounds, human sounds. Among the negative sounds for the sense of quietness, participants mostly indicated: ventilation and motorized sounds. The majority of the participants rated the overall landscape quality as “fairly good” and “good”. The fourth area, the public square Nettelbeckplatz, was perceived as “slightly quiet” and “not quiet” by the majority of the participants, a result relatively consistent with the noise levels of 54.5 dB(A). Among the positive sounds for the sense of quietness, participants mostly indicated: water fountain sounds, conversations. Among the negative sounds for the sense of quietness, participants mostly indicated: traffic sounds. The majority of the participants rated the overall landscape quality as “fairly good”. The fifth area, a linear green path along the Panke river, was perceived as “quiet”, “slightly quiet” , and “not quiet” by the participants, an ambivalent result considering the low noise levels of 46.3 dB(A). Among the positive sounds for the sense of quietness, participants mostly indicated: bird chirping, wind through the leaves, wind, water sounds, and also: foot steps, S-Bahn sounds. Among the negative sounds for the sense of quietness, participants mostly indicated: traffic sounds from cars and the S-Bahn, ambulance signals. The sixth area along the Panke river was perceived as “quiet” by the majority of the participants, a result consistent with the noise levels of 39.7 dB(A). Among the positive sounds for the sense of quietness, participants mostly indicated: nature, kids’ voices, foot steps (on gravel). And also: muffled noises, “quietness itself”, and bicycles. Among the negative sounds for the sense of quietness, participants mostly indicated: loud voices, kids yelling, and also dog barking, cars. The soundwalk in Mitte confirmed the interest and the potential of citizens in playing an active role in the evaluation and planning of the sonic environment. In the final discussion, participants drew the attention on the high level of noise pollution they suffer especially from traffic and asked for effective actions to calm the traffic down and protect housing from noise. To create healthy environments, noise pollution mitigation measures are of course necessary, but the two actions of noise reduction and quiet areas protection need to be implemented in parallel, as indicated by the European Environmental Noise Directive (END 49/2002). The World Health Organization also confirmed the importance of achieving this twofold goal: in the new Environmental Noise Guidelines, recently released on October 10 2018, the first guiding principle advocates for reducing exposure to noise, while conserving quiet areas. Although the WHO guidelines are not legally binding, we hope governments and officials will not dismiss its recommendations, considering the extent of the health problems associated with noise as clearly reported in the guidelines. Did you like our report? We are thrilled to get your feedback, so please get in touch at: info@opensourcesoundscapes.org. Am 11. September 2018 führten wir im Gebiet Pankstraße in Mitte einen Soundwalk durch, der im Rahmen der Öffentlichkeitskampagne zur Vorbereitung des nächsten Berliner Lärmaktionsplans “Berlin wird leiser” mit dem Ziel durchgeführt wurde, Akteure und BewohnerInnen des Gebietes in die Bewertung von Ruheorte rund um das Gebiet Pankstraße einzubeziehen. Der Soundwalk wurde von Dr. Antonella Radicchi (TU Berlin) geleitet und vom Berliner Senat, Senatsverwaltung für Umwelt, Verkehr und Klimaschutz in Zusammenarbeit mit dem Bezirk Mitte von Berlin und dem Quartiersmanagement Pankstraße organisiert. Der heutige Newsletter berichtet über die ersten Ergebnisse hinsichtlich der Bewertung von Ruheorte, die während des Soundwalk durch die TeilnehmerInnen erfolgte. Durch das Teilen dieser Geschichte möchten wir Ihre Neugier für Soundwalks wecken: starke partizipatorische Exkursionen, deren Hauptzweck es ist, der Umwelt zu lauschen, ihren akustischen Einfluss auf unsere Gesundheit zu bewerten und Strategien zu entwickeln, um sie zu verbessern. Soundwalks sind effektive Forschungsmethoden, die von der internationalen wissenschaftlichen Gemeinschaft übernommen und durch internationale Standardnormen, z.B. ISO 12913-1: 2014 und ISO / DIS 12913-2, reguliert werden. Wenn Sie mehr über die Methode des Soundwalking erfahren möchten, finden Sie hier den “Pocket Guide to Soundwalking” von Dr. Antonella Radicchi. Indem wir diesen Bericht mit Ihnen teilen, hoffen wir auch, Ihr Bewusstsein dafür schärfen zu können, wie wichtig es ist, städtische Ruheorte zu identifizieren und zu schützen – ein offenes Thema auf europäischer politischer Ebene. Die Europäische Richtlinie über Umgebungslärm (EG 49/2002) sieht vor, dass die Mitgliedstaaten und ihre Großstädte Pläne entwickeln müssen, um ruhige Gebiete zu schützen, als Maßnahmen zur Verringerung der Lärmbelästigung in Städten und zum Schutz der Gesundheit und des Wohlbefinden der Bürgerinnen und Bürger. An dem Soundwalk beteiligte sich eine Gruppe von 14 engagierten Berlinerinnen und Berlinern, darunter auch AnwohnerInnen sowie offizielle VertreterInnen des Bezirks Mitte von Berlin, des Quartiersmanagement Pankstraße und des Berliner Senats, Senatsverwaltung für Umwelt, Verkehr und Klimaschutz. Der Treffpunkt war an der Ecke Ruheplatzstraße und Antonstraße, wo Antonella eine kurze Einführung in die Aktivität gab. An die Teilnehmemenden, die nicht die Hush City App zur Beantwortung von Fragen nutzen konnten, wurden gedruckte Fragebögen ausgegeben. Anschließend führten die Teilnehmenden “Ohr-Reinigungsübungen” durch, die von Murray Schafer – dem Vater der Soundcape-Studien – erfunden wurden, um den Teilnehmenden der Soundwalks zu helfen, sich wieder auf die Umgebung einzustellen und die Ohren zu öffnen. Antonella führte den Soundwalk auf einer vordefinierten Route, bestehend aus 6 Hörpunkten, die in Abstimmung mit dem Bezirk Mitte, dem Quartiersmangement Pankstraße und dem Berliner Senat, Senatsverwaltung für Umwelt, Verkehr und Klimaschutz identifiziert wurden (siehe Karte unten). Die Teilnehmenden wurden eingeladen, langsam und schweigend eine Ideallinie entlang zu laufen, Antonella folgend, die die Gruppe leitete und gleichzeitig die akustische Umgebung mit ihrem H4 ZOOM-Rekorder aufnahm. Schweigend zu gehen und auf das Zuhören konzentriert zu bleiben, war eindeutig eine Herausforderung für die Mehrheit der Teilnehmenden, die dazu neigten, in kleinen Gruppen zu gehen und während des Laufens miteinander zu sprechen. An jedem Hörpunkt stoppten wir und die Teilnehmenden wurden gebeten, für ein paar Minuten still der Umgebung zuzuhören. Dann wurden sie eingeladen, den Ruheort, an dem wir uns befanden, mithilfe der Beantwortung der Fragebögen oder dem Benutzten der Hush City App zu bewerten. Am Ende des Soundwalk hatten wir eine Diskussion über die Gesamterfahrung. Während der herkömmliche Ansatz der akustischen Planung auf Messungen und Berechnungen zur Kartierung und Bewertung von Umgebungslärm beruht, zielt der Soundscape-Ansatz darauf ab, die akustische Umgebung zu untersuchen und konzentriert sich dabei auf die Art und Weise, wie “Menschen sie wahrnehmen, verstehen und / oder erleben” (ISO 2014) ). Um die beiden Ansätze zu verbinden, analysierten wir die Geräuschpegel, die an jedem Hörpunkt gemessen wurden, in Zusammenhang mit dem Grad der wahrgenommenen Ruhe, der von den Teilnehmenden anhand einer linearen 5-Punkte-Skala (nicht ruhig – sehr ruhig) angegeben wurde. Die Ergebnisse sind im folgenden Diagramm dargestellt. Diagramm, das die gegenseitige Bewertung der Geräuschpegel an den 6 Hörpunkten mit dem Grad der wahrgenommenen Ruhe zeigt, der von den Teilnehmenden an den gleichen Punkten angegeben wird. Bildquelle: © C.W., Hush City Mobile Lab 2018, TU Berlin. Die Gesamtauswertung der Daten zeigt eine Übereinstimmung zwischen den gemessenen Geräuschpegeln und dem von den Teilnehmenden wahrgenommenen Ruhegrad. Dies bestätigt die Annahme, dass BürgerInnen als intelligente, aktive Sensoren im Rahmen von Soundscape-Bewertungsprozessen betrachtet werden können (Radicchi et al. 2017). Ambivalente Ergebnisse fanden sich an fünften Ort, einem geradlinigen grünen Pfad entlang der Panke, der von den Teilnehmenden gleichzeitig als “nicht ruhig”, “ein bisschen ruhig” und “ruhig” empfunden wurde. Obwohl durch den Fragebogen viele Themen von den Teilnehmenden bewertet wurden, werden in diesem Zusammenhang nur die Ergebnisse diskutiert, die sich auf die Geräuschpegel; den Ruhegrad, die positiven und negativen Geräusche und die generelle Landschaftsqualität beziehen. Alles wird so wiedergegeben, wie es von den Teilnehmenden wahrgenommen wird. Der erste Ort an der Plantagenstraße 17 wurde von der Mehrheit der Teilnehmenden als “ruhig” empfunden, was mit den Geräuschpegeln von 41,3 dB (A) übereinstimmt. Unter den positiven Klängen für das Gefühl der Ruhe gaben die Teilnehmenden meist an: natürliche Geräusche wie Blätterrauschen, menschliche Stimmen und auch Kirchenglocken. Ein Teilnehmer nannte die “Abwesenheit von lauten Geräuschen”. Unter den negativen Geräuschen für das Gefühl der Ruhe deuteten die Teilnehmenden meist auf Verkehrslärm hin. Die Mehrheit der Teilnehmenden bewertete die Landschaftsqualität insgesamt als “gut”. Möchten Sie die von den Teilnehmenden mit der Hush City App gesammelten Datensätze in diesem Bereich erkunden? Klicken Sie hier! Der zweite Ort, der Spielplatz in der Adolfstr. 12, wurde von der Mehrheit der Teilnehmenden als “ein bisschen ruhig” und “nicht ruhig” wahrgenommen, ein Ergebnis, das mit dem Geräuschpegel von 50,5 dB (A) relativ übereinstimmt. Unter den positiven Klängen für das Gefühl der Ruhe gaben die Teilnehmenden meist an: Blätterrauschen, spielende Kinder und auch Unterhaltungen von Menschen sowie “ruhige Atmosphäre bei lauten Geräuschen”. Unter den negativen Geräuschen für das Gefühl der Ruhe gaben die Teilnehmenden meist (Kinder) Schreien an, obwohl einige Teilnehmenden ihre Antworten abmilderten, z.B. durch Kommentare wie “nicht normale Kindergeräusche, aber Kindergeschrei nach einem langen Arbeitstag.” oder “das laute Schreien der Kinder kann auf Dauer störend sein”. Der dritte Ort, eine kleine Fußgängerzone in der Gerichtstraße 50/51, wurde von der Mehrheit der Teilnehmenden als “ruhig” empfunden, was mit dem gemessenen Geräuschpegel von 46,3 dB (A) übereinstimmt. Unter den positiven Klängen für das Gefühl der Ruhe gaben die Teilnehmenden meist an: Blätterrauschen, Fahrräder. Und auch: Vögel, “Abwesenheit von lauten Geräuschen”, menschliche Geräusche. Unter den negativen Geräuschen für das Gefühl der Ruhe gaben die Teilnehmenden meist an: Lüftung und motorisierte Geräusche. Die Mehrheit der Teilnehmenden bewertete die Landschaftsqualität insgesamt als “ziemlich gut” und “gut”. Der vierte Ort, der öffentliche Platz Nettelbeckplatz, wurde von der Mehrheit der Teilnehmenden als “ein bisschen ruhig” und “nicht ruhig” wahrgenommen, was mit dem Geräuschpegel von 54,5 dB (A) relativ konsistent ist. Unter den positiven Klängen für das Gefühl der Ruhe gaben die Teilnehmenden meist an: Wasser des Brunnens, Gespräche. Unter den negativen Geräuschen für das Gefühl der Ruhe gaben die Teilnehmenden meist an: Verkehrsgeräusche. Die Mehrheit der Teilnehmenden bewertete die Landschaftsqualität insgesamt als “ziemlich gut”. Möchten Sie die von den Teilnehmern mit der Hush City App gesammelten Datensätze in diesem Bereich erkunden? Klicken Sie hier! Der fünfte Ort, ein linearer, grüner Pfad entlang der Panke, wurde von den Teilnehmenden als “ruhig”, “ein bisschen ruhig” und “nicht ruhig” wahrgenommen, was angesichts der niedrigen Geräuschpegel von 46,3 dB (A) ein ambivalentes Ergebnis ist. Unter den positiven Klängen für das Gefühl der Ruhe gaben die Teilnehmenden meist an: Vogelgezwitscher, Blätterrauschen, Wind, Wassergeräusche und auch: Schritte, S-Bahn-Geräusche. Unter den negativen Geräuschen für das Gefühl der Ruhe gaben die Teilnehmenden meist an: Verkehrsgeräusche von Autos und der S-Bahn, Signale von Rettungsfahrzeugen. Der sechste Ort entlang der Panke wurde von der Mehrheit der Teilnehmenden als “ruhig” empfunden, was mit den Geräuschpegeln von 39,7 dB (A) übereinstimmt. Unter den positiven Klängen für das Gefühl der Ruhe gaben die Teilnehmenden meist an: Natur, Kinderstimmen, Schritte (auf Schotter). Und auch: gedämpfte Geräusche, “Ruhe/Stille an sich” und Fahrräder. Unter den negativen Geräuschen für das Gefühl der Ruhe gaben die Teilnehmenden meist an: laute Stimmen, Kinderschreien, und auch Hundegebell, Autos. Der Soundwalk in Mitte bestätigte das Interesse und das Potenzial von Bürgerinnen und Bürgern, eine aktive Rolle bei der Bewertung und Planung der akustischen Umgebung zu spielen. In der abschließenden Diskussion machten die Teilnehmenden auf die hohe Lärmbelästigung aufmerksam, unter der sie besonders ausgelöst durch den Straßenverkehr leiden, und forderten wirksame Maßnahmen zur Beruhigung des Verkehrs und zum Schutz von Wohnungen gegen Lärm. Damit gesunde Umgebungen geschaffen werden können, sind natürlich Maßnahmen zur Lärmbekämpfung erforderlich, aber beide Maßnahmen – Lärmschutz und der Schutz von Ruheorten – müssen gleichzeitig umgesetzt werden, wie die Europäische Richtlinie über Umgebungslärm (END 49/2002)zeigt. Auch die Weltgesundheitsorganisation hat bestätigt, dass es wichtig ist, dieses zweifache Ziel zu erreichen: In den neuen Richtlinien für Umgebungslärm, die am 10. Oktober 2018 veröffentlicht wurden, setzt sich das erste Leitprinzip dafür ein, die Lärmbelastung zu reduzieren und gleichzeitig ruhige Gebiete zu erhalten. Obwohl die WHO-Richtlinien nicht rechtsverbindlich sind, hoffen wir, dass Regierungen und Verantwortliche ihre Empfehlungen nicht ablehnen werden, wenn man das Ausmaß der mit Lärm verbundenen Gesundheitsprobleme berücksichtigt, die in den Leitlinien klar beschrieben sind. Hat Ihnen unser Bericht gefallen? Wir freuen uns sehr über Ihr Feedback. Bitte wenden Sie sich an: info@opensourcesoundscapes.org. ← When is loud too loud? /// Wann ist laut zu laut?